According to a Gallup Organization survey, only 26 percent of employees at any company are truly engaged. Of the remaining 74 percent, the majority –– 55 percent –– are, in fact, disengaged and have no passion for their jobs. Even more concern-worthy is that the final 19 percent are actively disengaged. The problem, Swindell writes, is that too many managers simply complain about disengagement or transfer the blame to the employees. Are you one of those managers who’s confident enough in your team’s dedication to the company’s overall vision that you’d allow them to talk to a prospective employee about what it’s like to work at your firm? If so, you’re likely to consider yourself lucky to have such a tightly-knit, hardworking group of engaged employees under you. However, you may want to think again, suggests Clint Swindell, president and CEO of Verbalocity, a personal-development firm that focuses on leadership enhancement. According to a Gallup Organization survey, only 26 percent of employees at any company are truly engaged. Of the remaining 74 percent, the majority –– 55 percent –– are, in fact, disengaged and have no passion for their jobs. They’re not bad employees; they simply come to work each day, do the minimum they need to do to get by and collect their checks. Even more concern-worthy is that the final 19 percent are actively disengaged. They have no commitment to the company or its future, are opposed to almost everything you do and are not only miserable, but more than willing to share their opinions with other employees, hoping to bring them into their mode of thinking. The problem, Swindell writes, is that too many managers simply complain about disengagement or transfer the blame to the employees. Swindell uses an unusual format for business titles, breaking the book down into two segments. One segment is the outlay of his formula for engagement. The other segment is a fictional account of how Seth –– a new manager at a Fortune 500 call-center firm –– learns the nuances of employee engagement through the mentorship of his boss and several fellow managers. According to Swindell, the key is to apply the three elements within his formula. The first element is directional leadership, which starts with communication. “Whether you’re creating a new vision from scratch or tweaking an existing vision, you have a responsibility to share it with the people who can help you realize it,” he states. How this is accomplished varies, but the goal is to get employees to agree to, not with, the strategy. This involves four challenges: (1) recruiting support from the top 26 percent of the work force; (2) preparing the organization for change; (3) letting employees know how they contribute and what’s expected of them; and (4) constantly communicating progress to prevent people from leaning toward the old ways. Swindell’s second element is motivational leadership. This involves all employees, engaged and disengaged, and is accomplished via leading with positive motivation. This includes asking employees what inspires them and focuses on what they’re doing well, as opposed to what they’re doing wrong. Another element is celebrating small successes. “Most leaders are so focused on the larger goal that the achievement of the smaller goals goes unnoticed,” the author writes. Creating an impulsive reward system, a way to celebrate successes and a time to do so can bring about larger achievements. The last element of Swindell’s formula is organizational leadership. 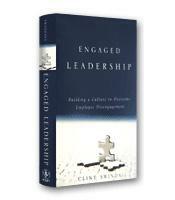 This focuses on the development of the team and a culture that overcomes employee disengagement. This is completed by meeting four more challenges: (1) identifying and positioning the appropriate talent; (2) building a generational bridge by understanding the generations and what motivates them, suspending judgment about them and understanding their needs; (3) moving toward true empowerment by providing information, giving authority along with responsibility, sharing the power and letting people solve their own problems; and (4) establishing a strategy that maintains success by having a succession plan and documenting procedures. The final and possibly most important idea that Swindell underlines in the book is that all of this is worthless without a solid company core of strong business ethics and integrity. While Swindell is not a fiction writer, his use of narrative structure illustrates his points well. The reader is able to see that, with the proper mind-set, it is entirely possible to accomplish engaged leadership within any company. That, in addition to his point-by-point how-to portion, makes Engaged Leadership an important title.